Coming alive again at Oubaai! I've just completed the PGA National Championships at Oubaai yesterday and finished an amicable 17th overall. It been a while since I've played a national event and boy it was great feeling to be alive again! The adrenaline and the butterflies were flowing. It's so different playing medal golf where every shot counts and when the course is set-up to tournament standards. I actually felt that I played much better than my scoring showed, but in medal play, EVERY shot counts and a few lose shots (probably from my lack of tournament play) cost me dearly! It was wonderful to spend some time with old 'mates' from my touring days. The likes of Roger Wessels, Wayne Bradley, Andy Bean, Greg Jacobs, Mark Wilshire, Richard Kaplan, Dave Usendorf and Ryan Reid, all of whom have and continue to add great value to the golfing industry. 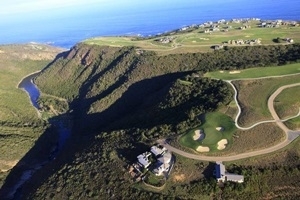 Oubaai, which is maintained by my friends at Golf Data who are also responsible for the awesome job they doing at Wedgewood, was in subliminal condition. I certainly haven't played on greens that pure and fast in years; I can't tell you how quick some of those putts were, it was like putting on glass! The PGA of South Africa did a great job in hosting the event and I want to extend a special thank you to the main sponsor Diners Club for their continued support! The feeling that I got from all the Pro's was that golf has turned the corner. So let's all be ambassadors of this game wonderful game, let’s motivate and encourage people to start playing or to come back into the game. We need golf clubs to move away from their archaic committee systems that certainly hasn't helped them move forward. The buck needs to stop at the GM's and Pro's of the clubs. They are the people who should be responsible and accountable for the success of the clubs. We need to make golf fun again and clubs need to be open to move with the times, they need to offer and promote what people actually want and what they are willing to spend money on. Ok, that's enough of preaching, I just get frustrated with what I'm seeing out there! 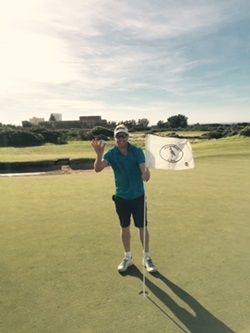 An Albatross for Mike Holden! So, talking about playing golf, a week back I had the pleasure of playing golf with my oldest golfing buddy, Mike Holden. Mike has been putting loads of work into his game. He’s been taking lessons with Graeme Whale, working on the range and playing his minimum of 1 round a week and it's paying off! I was fortunate enough to witness his first albatross when he popped his second into the par5 7th hole at Humewood, he went ballistic! It was great to see Mike and good luck to him in the Humewood Club Champs final. On the retail side, April was a must better month for our business, this was a relief for us as February and March was unusually sluggish. May has started off on a good note and that has been mainly due to the good weather and also loads of guys now going on their annual golf tours. Corporate golf days start kicking in now as the favourable 'winter' rates that the clubs offer encourages this. If fact our corporate side of our business has shown unbelievable growth and I would like to encourage you to click here should you require any logo balls, corporate shirts, etc. Huge congrats to George Coetzee for winning in Mauritius this last weekend and I see that Trever Fisher is leading in Spain. Go South Africa! 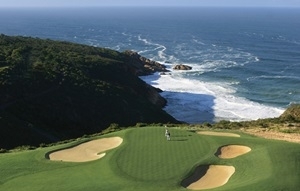 I'll be playing George today and all the Fancourt courses this weekend, so eat your heart out!! Have a great weekend and many thanks for all of your on-going support!